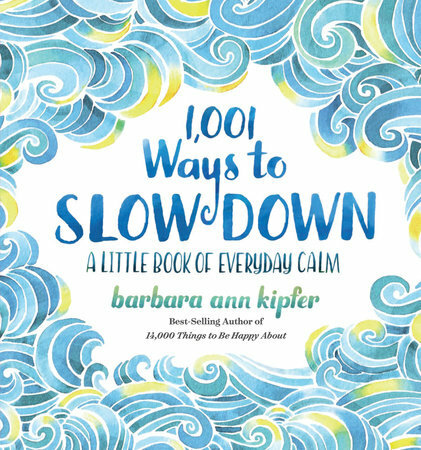 1,001 Ways to Slow Down is a list book of just that - ways to slow down. It not only offers several (SEVERAL) tips on ways to slow your roll, but also different activity lists, movies to watch, and other methods of calming down. I had been feeling pretty anxious and a little all up in my head when I got this book in the mail, so it did come at the perfect time. I took a pen and marked some of the tips I felt really touched base with me (such as "skip a workout if it means hanging out with loved ones" and "slow down when driving" and "is the light going to turn green faster is you inch up on it?"). Some of the tips seem a bit silly ("sharpen a pencil with a knife") but for the most part, I found the tips very helpful. They made me stop and think about how much I do rush through life. I am rarely ever "in the moment", rather I spend time thinking about what comes next. Ironically, as I got further into the book, I got a little bored with the list and wished I could put the book down and wait until I needed to slow down again to pick it up. But I couldn't, because I had a review to write. So I hurried through the tips to slow down. So...basically I wish I could have just stumbled upon this book and picked it up when I needed it. It's a good book to keep on your shelf for those days when life gets the best of you and you just need to chill. Dr. Barbara Ann Kipfer is the author of 14,000 Things to Be Happy About and the Page-a-Day calendars based on it. She has written more than 60 books, including 1,001 Ways to Live Wild, The Order of Things, Self-Meditation, Instant Karma, 8,789 Words of Wisdom, The Wish List, and 4,000 Questions for Getting to Know Anyone and Everyone, and she edited Roget's International Thesaurus. She holds PhDs in linguistics, archaeology, and Buddhist studies. Dr. Kipfer is the Chief Lexicographer of Temnos and has worked for such companies as Answers.com, Ask Jeeves, and Dictionary.com. LOL It is such a shame that you had to rush through a book about relaxing! I hope you get a chance to actually relax and enjoy it sometime soon.